Google has announced it's going forward with a new way to text on an Android phone, swapping out the default Messenger app for a new texting app called Android Messages. Specifically, enabling RCS on Android Messages allows features like group chat, high-resolution image sharing, and those little "Read" tags that let you know someone's seen your message. This would allow Android Messages to work more on par with the likes of WhatsApp, Facebook Messenger and Apple's own Messages service (to an extent), which have quickly become the go-tos for mobile messaging due to a wider set of features. Despite 27 different providers and device manufacturers - to include Sprint, Deutsche Telekom, Rogers, and Globe - joining in on Google's RCS efforts, big names like Verizon, T-Mobile and AT&T were conspicuously missing from Google's news announcement. This is likely because, as noted by Android Police, these larger service providers have their own take on RCS messaging services that could be seen as stepping on Google's toes, or vice versa. Additionally, concerns have arisen about how adding "smart" features to texting - especially on an platform like Android - could be seen as a possible security hazard, according to Recode. 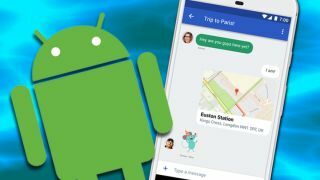 It will take some time to see how Android Messages pans out for telecom companies and customers alike, though those running an Android phone from almost every major manufacturer - ranging from HTC to Motorola to LG to even Google's Pixel - will be capable of preloading the new app starting today.